At the Taylor Shellfish hatchery we have been having trouble producing enough Pacific oyster larvae to supply our farms. For the past few months, we have seen that the larvae just stop growing after about Day 6. Their digestive glands are empty and they are not actively swimming. In one case, we saw 100% mortality (empty shells by Day 8). We have been experimenting with different treatments, food, and water supplies to try and rule out different factors influencing survival. In the last experiment we found that larvae reared in two different locations within the hatchery performed much better than in the high-density flow through room where we rear all of our production oysters. 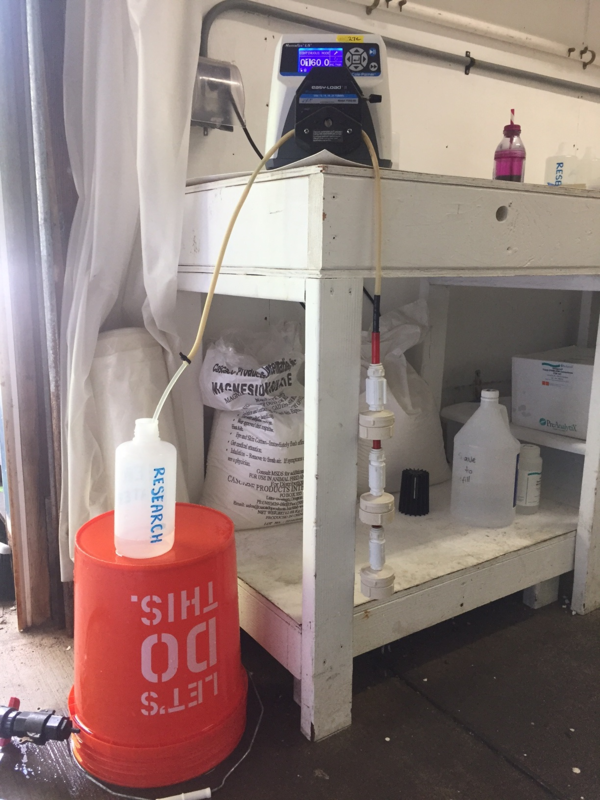 In this experiment, we are further testing the idea that there might be some issue with water quality in the production resevoir. There are three locations we are growing larvae. The control conicals in each location refer to larvae being supplied with the water that normally is pumped to that system. Conical 1 and 2 are being supplied with water from the production resevoir. Conical 3 and 4 are being supplied with “control” water coming from Molly’s system in the NGH. Conical 6 and 7 are being supplied with “control” water which comes directly out of the treatment tank. Conical 41 and 42 were being supplied with “control” water until Day 3 when the temperature was steadily increased to 28C. Histology I will fix samples in 10% formalin for Ralph. At the same time I will sample larvae using PaxGene. Proteomics Samples will be flash frozen in liquid nitrogen and stored in -80C. Samples will be taken during tank changes when larvae are dropping onto screen. I did not rinse with freshwater. Microbiomes I will use 5um, 0.7um, and 0.22um in a series to capture potential protozoans and bacteria. I am using a peristaltic pump running at 160 ml/min and I am filtering 1L of effluent seawater from each of the conicals. Seeing some differences in the Duck room at Day 12! From left to right are Duck room-round tank water conical 1, Duck room-round tank water conical 2, Duck room-control conical 6, and Duck room-control conical 7. On Day 16, I did not screen larvae to get a weighted average screen size. There were too few larvae to do this accurately. Instead I measured 50 larvae from each conical and to quantify I took 100ul subsamples from a known volume to count 50+ larvae. I counted 6 subsamples to estimate and calculate how many larvae were in each conical. I estimated the weighted average screen size using the Pythagorean Theorem. This way I can compare growth between the three days. This means the estimated weighted average screen size for the larvae would be 191.98 um.